Knurling tools have been used for many years and there have been adaptations of these particular tools to create textures and patterns on work. 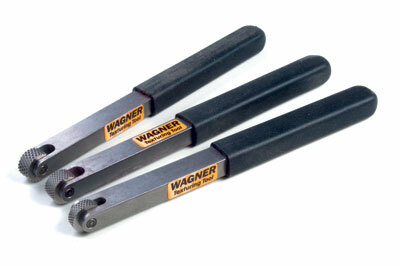 These three tools from Wagner are precision knurling tools with hardened toothed wheels. They are simple to use and designed to create a texture, or I would say knurled design, in a user-chosen area. They comprise of a ground square stock shank with a rubber sleeve which acts as the handle area; a fork in the end houses the knurling wheel. This is held in place by a machine ground pin. It is as simple as that but there are three sizes available - one with a narrow wheel for small work with a narrow 6mm (1/4in) wheel with a fine 16tpi knurl pattern and 10mm (3/8in) wheel sizes with either a 12 or 16tpi knurl pattern. The wheels run true and are very precise. There is no play in them at all so one can approach with confidence. It is simply a case or deciding where to texture/knurl. Set the lathe at a low rpm (500rpm is a good speed to try first, adjust the speed up or downwards as desired), present the tool horizontally to the work and push into the work with firm applied and sustained pressure. The wheel will rotate with the wood and 'indent' the work with the knurling pattern. Obviously, the finer the teeth pattern, the finer the knurl. I found that like most textures, it is best used in a small area and looks best when contrasted against plain-turned areas. 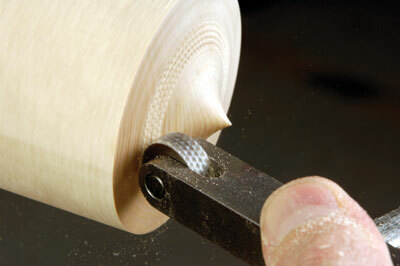 The cutters do not need sharpening, so are likely to last a lifetime. The instructions are clear and concise. and there is a You Tube link from the Craft Supplies catalogue showing how to use and maintain the tool. This is likely to be the norm for tools in the future and is an ideal way of seeing how to use a tool before buying one. The tool is one of those items that is superbly made and designed to do what is says it does with the minimum of fuss and explanation. It is a low-cost item that will enable turners to explore some texturing ideas with a minimum cost outlay. I truly believe it is an excellent accompaniment for any turners' tool kit. "The tool is... superbly made and designed to do what is says it does"
Please note: Anyone buying from inside of the USA will possibly be subject to sales tax, those ordering from outside of the USA may be subject to import duty and VAT as appropriate to their particular countries terms. All items are subject to p&p charges.